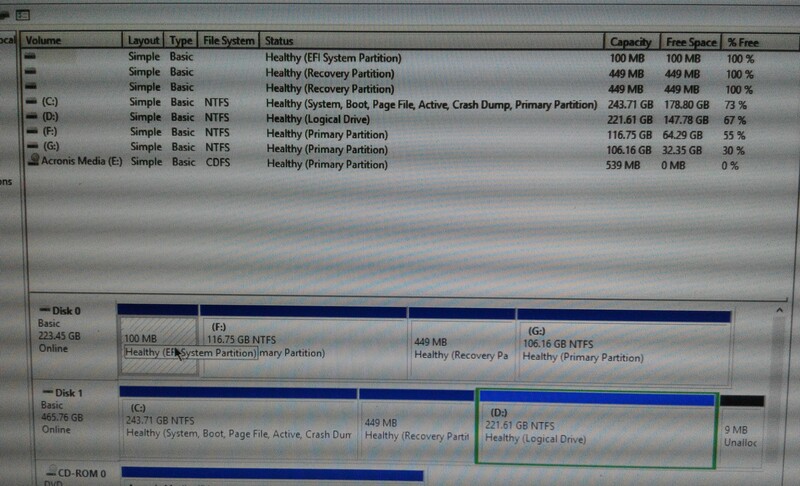 I was able to clone from a Seagate HDD to a Kingston SSD but when I pull it the HDD out and left the SSD in the system. It is unable to boot from the SSD alone and even Acronis True Image 2016 Bootable media had cloned it. Please let me know the right step to resolve this step by step. After the clone, before booting, did you pull the original hard drive and then move the clone drive to the SATA connection where the original hard drive used to be? If so, does your bios detect the hard drive (F2 usually to get into bios on most systems). If the drive is not seated correctly, it may not register in the bios either. Then save the bios settings and reboot - any luck after that. If not, what message/error are you getting (if any)? Hopefully (also), you cloned the correct drive to the other one and not the wrong way around or you now have 2 blank hard drives instead of two clones with the same data. If it is still not booting to Windows after the other items mentioned above, if you have your acronis bootable media, boot into that and then do a file/folder backup (just pretend to) and navigate the main drive to make sure it has the expected data on it. If not, go back and check your original drive too to verify you didn't clone the blank drive to the original drive instead of cloning the original drive to the blank one. I did that but still unable to boot into the cloned ssd harddisk and prompt 'unable locate boot drive' error. I think the MBR is not cloned properly. BTW I already check the cloned SSD harddisk there is information inside but can't boot. So what did I missed? BTW this windows 10 upgraded from Window 8. Will this be an issue? Not sure if this will help but have attached the file of the final result in windows 10 disk managment. Is Disk 0 or disk 1 your new drive and which was the original drive for clarification? Disk 1 does not have a system EFI parition so that is why it is not booting if it is supposed to be an EFI/GPT disk. If it is booting as the sysetm you took the picture of, then it is an MBR / legacy build. Disk 0 seems to be an EFI/GPT disk. However, if the original drive was MBR and you imaged it and it resulted as an EFI disk, I suspect that is the issue. Technically, it's supported, but can cause trouble. For simplicity, you want to make sure that whaterver your original hard drive was installed as is how you boot into your Acronis bootable media and how your restore the image. Exampe1: Source drive is Legacy Bios with MBR formatted disk. Boot Acronis bootable media in Legacy/Bios mode (non-uefi). Restore image to new drive (make sure it's formatted as MBR and not GPT first). Result should be a bootable hard drive. Example 2: Source drive is UEFI Windows OS on a GPT formatted disk. Boot Acronis bootable media in UEFI mode. Restore iamge to new drive (make sure drive is formatted as GPT and not MBR). Result should be a bootable hard drive. Finally I installed the software into the pc and rerun the cloning and ite works. How come cannot work with bootable media? Simon, I can't say as I have no way of knowing the exact steps you took to clone with bootable media and/or your system setup. Most clone issues actually occur with started from within windows and not with the bootable media... as Windows will actually reboot and boot into bootable media created on the local disk first and load it into a RAMDISK like the bootable media already does. Cloning can fail if there are any dirty sectors on either drive. It can fail if you boot the system after the clone and leave the original drive connected as well (because both disks will have the same hardware ID and can confuse the bios). Not really sure. If you had a "spare" drive, you could test cloning from the bootable media to it again (to avoid using your main drive for test purposes) and see if it is successful or also fails again. I have never used "clone". I always take a full disk backup and restore the image to the new drive and it works 1st try with the bootable media - when restoring the image to the same hardware, but a different/new drive. Cloning is a bit more limited and even the instructions recommend taking a full disk backup before attemting a clone - just in case. I just bought new ssd 480 gb. I want to clone from 240 gb to 480 gb both ssd. But booting on 480gb fail. I have tried clone to file and then to new 480gb ssd and it still cannot boot. Now trying direct cloning. Not sure it will work. It's Windows 10. Simon, I would recommend opening a new Topic for this new cloning problem and start over from the beginning. Some basic questions: Is this the same computer from over 2 years ago? What type of SSD drive is the new drive, is it the same as the one being replaced or is it a different type of drive such as a NVMe M.2 drive? Are you still using ATI 2016 or have you upgraded to a later version?